Do you sometimes use words like “I won’t,” “I can’t,” “I don’t know how,” and “I wish I could” in your self-talk or when conversing with others? While it’s okay to use such words when the situation calls for it, someone who uses self-limiting lingo like these on a regular basis subconsciously tunnels him/herself into a life of limitations, powerlessness, and self-doubt. On the other hand, someone who uses empowering language like “I can”, “I am”, and “This will be mine” attracts abundance, achievement, and success, simply because such language sets him/her in the right mindset to succeed. While not scientific, this graphic does help us to see the impact that positive and negative our language has on our life. I can definitely see past situations where I used “I can’t,” “I don’t know how,” and “I wish I could” and ended up feeling anguish, victimized, and miserable even though I had put my best foot forward in those situations. 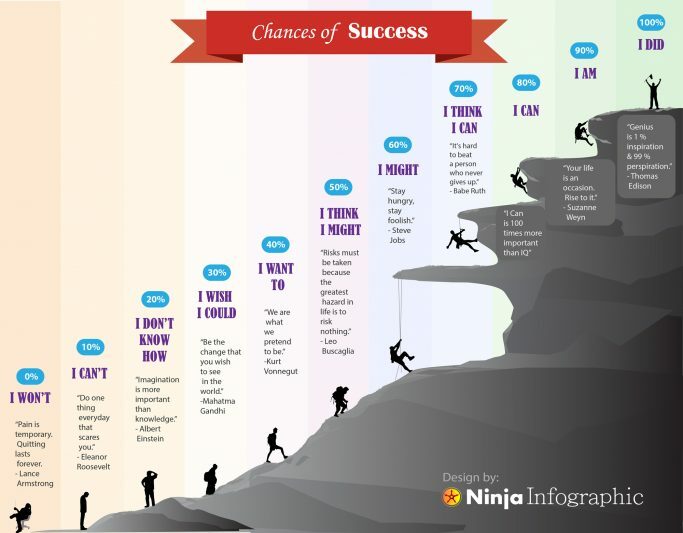 On the other hand, I’ve worked through problems with the mindset of “I can,” “I am,” and “I will” (not inside the infographic) and achieved great results, even though I didn’t have the solutions at the start. Because I believed that I could, I found a way to work through the problems by hook or by crook. Which category do you belong to? Do you use negative or self-doubting lingo in your daily language? How can you start using empowering language like “I can,” “I am,” “I will,” “This will be mine,” and “I will get it done?” Replace your negative lingo with empowering lingo from now on.